It’s almost summer and time to be outside in the garden. If you’re like me, you enjoy decorating in your flower garden but it can get a little pricey, and if your budget is tight, there might not be room for “luxury” items like garden decorations. 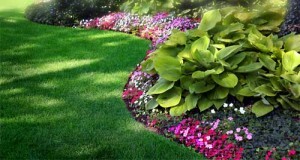 Here are a few of my favorite tips for prettying up your yard while keeping the budget in line. I have found some great bargains on garden kitsch at local dollar stores in my area. Granted, some items border on tacky but hey, maybe that’s what you’re after–no problem there! Whatever you’re looking for–garden stakes, flower bed border, decorative items, wind chimes, flower pots and more–you can find it at the dollar stores and the prices are usually just right for any budget. I have also found a number of great items for my garden decorating projects at the thrift stores in my area. Sometimes the prices are phenomenally cheap and sometimes not so much. Either way, I can usually find something that would be a great addition to my garden at a great price. Yard sales are another favorite for me to find some treasures for my garden. This, like thrift stores, is hit and miss but usually the prices are just right. This idea is one of my favorites–repurposing things I already have into items for the garden. These can be things like old buckets, old wooden or metal chairs, metal lamps and the like. Take a look around your home, basement, storage sheds and see what you’ve got and figure out how to turn it into a garden ornament. A little paint and some sprucing up can make it just perfect. If all else fails and you can’t find exactly what you are looking for to add to your garden, make it yourself! Even if you’re not especially crafty, you can learn and put forth your best efforts to make a few things on your own. Take a stroll through your local craft store and see what’s available. You can purchase ready-to-make kits or if you have craft supplies already stockpiled, put on your thinking cap and come up with a few ideas for homemade decorations. Grab a few craft books or magazines for inspiration and see what you can come up with…made by you.